Continued activity but no drama --- CNN is loudly filling time. We're handing over to the Hawaii live stream. Readers are invited to send in any information. Hawaii awaits the third wave of the tsunami. Live footage shows a reef in Hilo Bay disappearing as water rises. As Honolulu television shows live shots of Hilo Bay, a gentleman can be seen clearly walking along the beach. Anchor: "That's probably one of the most idiotic things I've seen." A reporter adds that three or four surfers are "having a heckuva session". The death toll is now 214, according to the Chilean Interior Ministry. The 8.8-magnitude earthquake in Chile was the fifth-strongest in history. In towns close to the epicenter, including Curico and Talca, more than 80 percent of buildings collapsed. There have now been 63 major aftershocks. Report of 5-foot tidal wave at Chatham Islands, 430 miles southeast of New Zealand. Oscillations are from a metre above normal level to a metre below, in intervals of about 20 minutes. 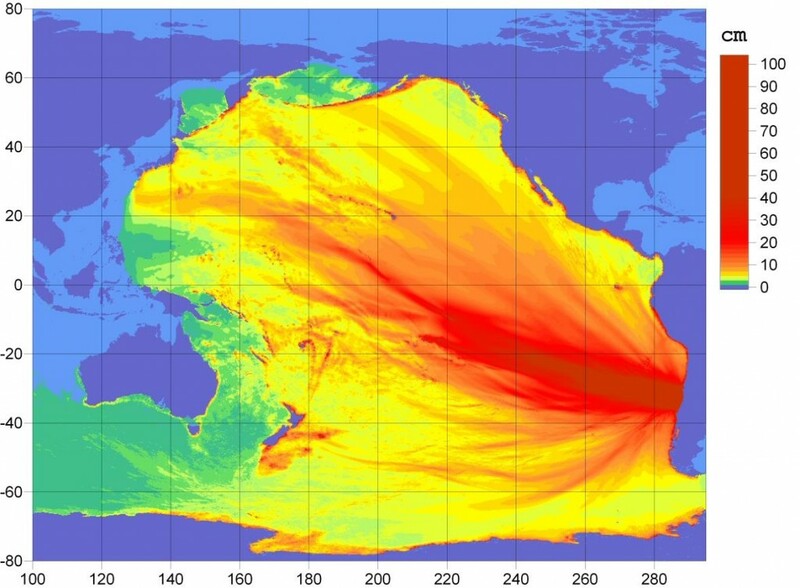 There are indications that the first waves of a tsunami may be arriving at Hawaii, but image still indicate shifting tidal patterns so far rather than a large build-up of water. Reports of water receding near Hilo. Reef now exposed at Hilo Bay. Coconut Beach completely under water. Reports of tidal shifts off Oahu but no sign of tsunami yet at Hilo on Hawaii's largest island. The prime minister says Canada is ready to help in the aftermath of a deadly earthquake in Chile. In a statement, Stephen Harper says Canadian officials in Santiago and Ottawa are assessing the damage, and trying to determine whether any Canadians are affected. As the tsunami warning in Hawaii reaches the citizens, more people are stockpiling food, fuel and other supplies in case the tsunami causes major damage. The Weather Channel feed is providing a steady stream of photographs. The director of the National Emergencies Office of Chile has announced that the number of dead stands at 147. Report that at least 209 prisoners have escaped from the main prison in Chillan. Chillan is located in the Biobío region, which has been the most seriously affected region. 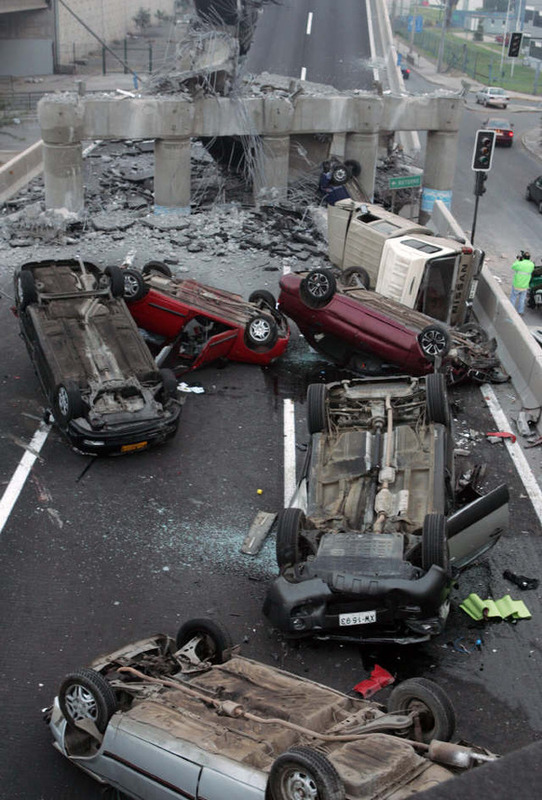 Boston.com has pictures of the damage caused by the earthquake. All college campuses in Hawaii have been closed. Surfers have been cautioned to stay off the beaches. Waikiki corridor will shut down in 3 hours. US President Barack Obama is expected to make a statement about the Chile earthquake in about an hour. The US government has confirmed that so far no Americans have been reported missing or dead. Fatalities have now been reported from the Juan Fernandez Islands. At least 3 people have been killed and 10 are missing after a large wave inundated large portions of the island’s coast. At least 3 people are missing on Robinson Crusoe Island. The waves that hit French Polynesia were as high as 6 feet (2 metres), but no damage assessment is available yet. A new wiki to help in search, rescue, and gathering of information has been created and uploaded. The White House has issued the number for US citizens seeking information about loved ones in Chile. You can call the State Department’s Consular Affairs Bureau on 1-888-407-4747. At least five people have been confirmed to have died in Viña del Mar in Valparaíso Province, north of Santiago. The Dutch Foreign Ministry says it is still trying to account for 27 Dutch nationals. Wave surges are expected to be 9-12 feet. Hilo airport has been closed. The death toll currently remains at 122 with perhaps hundreds more injured. Reuters reports that it would take almost three days to assess the situation fully, but the death toll is likely to not rise dramatically. Reports on Twitter from the Juan Fernandez Islands are grim. According to a pilot who flew over the islands, the tsunami waves have caused wide-spread destruction in a zone of three kilometres (a little less than 1.4 miles). 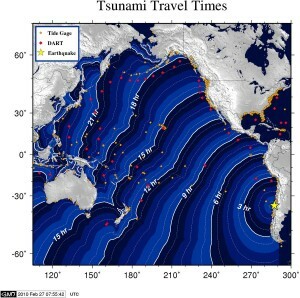 Reports indicate that Chile's Juan Fernandez Islands may have been severely hit by the tsunami. The islands are 415 miles west of the Chilean mainland and have a population of around 500 people. An earthquake registering 6.3 has hit close to the city of Salta in northern Argentina, on the border with Chile. Dozens of pictures have been uploaded by social media users in Chile. The first tidal wave has hit French Polynesia at Gambier. It was under 1 meter, and no damage was reported. Google maps has released new maps for users to pinpoint the location of the quake and major population centers near the epicenter as well as other useful information. A tsunami advisory is in effect for California. The initial wave is due to hit at 1:26 p.m. local time (2126 GMT). Chile in the past two months has been struck by more than a dozen earthquakes. The location and timelines are on this interactive map. The National Data Buoy Center has detected a tsunami 2,900 nautical miles southeast of Hawaii. The Pacific Tsunami Warning Center says the wave is currently hitting Papeete, Tahiti. The capital of Santiago lost electricity and basic services including water and telephones. Bachelet said regional hospitals had suffered damage; some were evacuated. A major bridge connecting northern and southern Chile was rendered inoperable, and the Santiago airport was shut down for at least the next 24 hours. Chilean television showed buildings in tatters in Concepcion, with whole sides torn off. At least two buildings there were engulfed in flames, and roads in the city were broken up, video showed. The White House said on Saturday it was closely monitoring the potential threat of a tsunami generated by a massive earthquake in Chile and said it stood ready to help Chile in its “hour of need.”Civil defense officials on the U.S. Pacific island state of Hawaii said they were preparing to start evacuations from shoreline communities. Reports from Twitter suggest that a wave at least four feet high hit the cities of Coquimbo and Valparaiso in central Chile early this morning. The damage so far can not be assessed. The Ministry of Interior in Chile has issued a statement trying to calm residents about tsunami warnings. According to the ministry, the country was no longer in danger as the tidal waves have moved past Chile’s islands in the Pacific. A PersonFinder tool has been developed quickly by coders for use by concerned relatives and friends of Chileans and foreigners inside Chile. You can visit via Google to submit queries and find out information about your loved ones. You can get information about survivors and victims from the Chilean Embassy in Caracas, Venezuela by calling one of these numbers: 9923378 / 9923378 / 9925364 / 9931538 / 9935770. You can also seek information from the Chilean consulate in the Ecuadoran city of Guayaquil by calling (+593-4) 2564619, 2562995 or e-mailing cggye2@gye.satnet.net. New death toll: 85, according to the Chilean president. The number is just from one region, Maule, out of the three that have been severely affected by the Tsunami. The quake in Chile was 1,000 times more powerful than the magnitude 7.0 earthquake that caused widespread damage in Haiti on Jan 12, killing at least 230,000. CNN’s Nick Valencia reports that the Contemporary Art Museum in Santiago has fallen, and the Fine Arts Museum in the city has partially collapsed. CaribNews reports: All U.S. Embassy personel, about 118, are accounted for, the U.S. State Dept tells Breaking News Online, but the Embassy has no information on American casualties. A warning message has been sent to any Americans on the ground. Update on Airport in Santiago: newest reports indicate that the airport will now be closed for the next 72 hours. More news streaming out of Chile report of a dire situation in Concepcion, just 70 miles north of the epicenter of the quake. According to twitter sources, collapsed buildings can be seen in many parts of the city and communications are mostly down. CNN’s Betty Nguyen tweets: "Chile TV reporting 15-story building collapsed near epicenter. Witnesses hearing screams from people trapped inside." CNN has provided the following number to call from the US if you’re looking for people in Chile: 1-888-407-4747. Chile’s remote Robinson Crusoe Island was hit by a huge wave after a massive earthquake rocked the country and aid ships had been sent to the rescue, President Michelle Bachelet said Saturday. The island, part of the Juan Fernandez Archipelago, lies some 700 kilometres out in the Pacific from the Chilean mainland. Dozens of buildings and bridges have collapsed in Central Chile. The death toll remains at 78 at this point. Dozens, perhaps hundreds, of people may be trapped under the rubble. In Hawaii, waves of up to 5 meters are expected as the tsunami travels west through the Pacific Ocean. All coasts of the island are dangerous and should be avoided. The tsunami is expected to make impact in Hawaii just past 11 a.m. local time (2100 GMT). Information on Hawaii's evacuation plan has been posted. The first set of pictures of devastation from the earthquake has emerged from Chile, and there is also a picture from the city of Maipú in central Chile. The US state of Hawaii is under a Tsunami Warning.In other news, Santiago’s main airport is going to remain closed for the next 24 hours, according to Chilean officials. A massive magnitude-8.8 earthquake struck south-central Chile early on Saturday, killing at least 47 people, knocking down buildings and triggering a tsunami. President Michelle Bachelet confirmed 47 deaths and said more were possible. Telephone and power lines were down, making damage assessments difficult in the early morning darkness. “Never in my life have I experienced a quake like this, it’s like the end of the world,” one man told local television from the city of Temuco, where the quake damaged buildings and forced staff to evacuate the regional hospital. The U.S. Geological Survey said the earthquake struck 56 miles northeast of the city of Concepcion at a depth of 22 miles at 3:34 a.m. (1:34 a.m. ET). Chilean television and radio stations said several buildings collapsed in the city of Curico and that there was damage to buildings in the historic center of the capital Santiago, about 200 miles north of the epicenter. The capital’s international airport was forced to close, a highway bridge collapsed and chunks of buildings fell into the street. In the moments after the quake, people streamed onto the streets of the capital, hugging each other and crying. There were blackouts in parts of Santiago and communications were still down in the area closest to the epicenter. Bachelet urged people to stay calm. “With a quake of this size we undoubtedly can’t rule out more deaths and probably injuries,” she said. An earthquake of magnitude 8 or over can cause “tremendous damage,” the USGS says. The quake that devastated Haiti’s capital Port-au-Prince on January 12 was rated magnitude 7.0. It issued a tsunami warning for Chile and Peru, and a tsunami watch for Ecuador, Colombia, Panama, Costa Rica and Antarctica. Chile’s navy said officials had lifted the tsunami warning in southern Chile, local radio reported. As news from Chile starts to pour in, there has been another earthquake some fifty miles east of Japan’s Okinawa Islands. Both Chile and Japan lay on geologically active zones and earthquakes strike both countries frequently. The number of dead in has now risen to 78.The number is expected to rise as more reports from different parts of Central Chile reach the center. For now, all one could do is hope the loss of life is minimal. Twitter user Elliott Yamin reports that at least 30 aftershocks have so far been felt in the Chilean capital after the initial quake. CNN’s Nick Valencia reports that Edmundo Perez Yoma, Chile’s Interior Minister, told local station TVN that the number of dead had now climbed to 64. Reuters now reports that the number of deaths in Chile has gone up to 47. According to their report, communications are down in Central Chile as well as telephone lines. This has made damage assessment very difficult. For now, the damage has been assessed as being tremendous. The quake was only 70 miles south of Chile’s second largest city, Concepcion. There has been a tsunami warning issued for all the countries on the west coast of South America as well as some in Central America and others in Eastern Asia. Location: West of Argentina in Southwestern South America. Area: 292,183 square miles or roughly the size of the US states of Texas and Oklahoma combined. Population: Over 17 million, most concentrated in the central part of the country. I have a family member in Pucon, does anyone know how badly it was hit? We haven't heard from her yet.